Virtually every resident of Texas lives near a pipeline. Our state is home to more than 225,000 miles of pipelines, but because they are typically located underground we can’t easily see them. Pipelines crisscross our yards, neighborhoods, communities, state and country safely transporting energy products every day. They connect to gas appliances in our homes and are located around our homes and businesses in underground corridors, called pipeline right-of-ways. 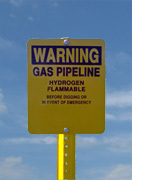 Pipeline companies place signs, called pipeline markers, at regular intervals to mark the general, not exact, location of pipelines. Markers are located in pipeline rights-of-way, at road and railroad crossings and at all aboveground facilities. Markers can vary in shape, size and color, but they all include the type of product transported, the pipeline operator’s name and an emergency contact number. It is a federal crime to damage, remove or destroy a pipeline marker. 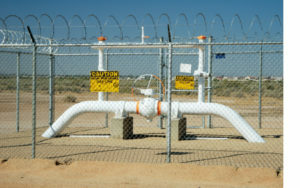 Read more about pipelines markers and see examples of different marker shapes by visiting the Pipeline & Hazardous Materials Safety Administration web site. There are two online mapping systems to help you locate pipelines near your home or business. The National Pipeline Mapping System (NPMS) shows the location of pipelines regulated by the U.S. Department of Transportation. The Texas Railroad Commission (RRC) manages an online mapping program for pipelines only in the state of Texas, but may not include pipeline systems for local residential, commercial, and industrial deliveries. ALWAYS CALL 811 TO HAVE ALL UTILITY LINES MARKED BEFORE YOU DIG. 811 – Know What’s Below. Call Before You Dig. 811/One Call is a national free service created to help protect you from unintentionally damaging underground utility lines while digging. One Call works with utility companies to mark the location of underground lines before you dig. When you dial 811, utility operators are notified and mark the location of underground lines with paint or flags. Each utility marks its lines with a specific color. Click here to view a chart that explains marking colors and the types of utilities they represent. In addition to buried pipelines, you may also live near aboveground facilities of the pipeline system. At these above ground facilities, you will generally find markers (signs, posts, etc.) to help identify the owner/operator of the system. These markers include a company name and phone number to contact if you have questions or to request additional information.